Cardiganshire: Broncastellan, Caelan y Maesmor, Clarach, Cwm Rheidol, Cyfoeth y Brenin, Cynill Mawr, Elerch, Henllys, Issayndre, Llanafan, Lower Llanbadarn y Croyddin, Upper Llanbadarn y Croyddin, Llancynfelin, Llanddeinol, Lower Llanfihangel y Croyddin, Upper Llanfihangel y Croyddin or Eglwys Newydd, Llangwyryfon, or Llangrwyddon, Town and Liberties of Abertstwith (4), Upper and Lower Llanilar, Llanrhystyd Haminiog, Llanrhystyd Mevenidd, Llanychaiarn, Melindwr, Parcel Canol, Rhosdie, Trefeirig, Tyr y Mynach, Uchaynydre, Upper Vainor, Lower Vainor. The population falling within the union at the 1831 census had been 20,026 — ranging from Broncastellan (population 144) to Aberystwith itself (4,128). The average annual poor-rate expenditure for the period 1834-36 had been £4,914. 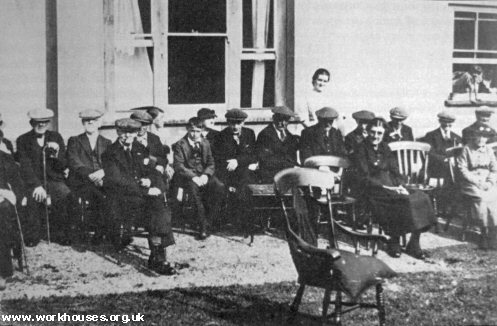 Aberystwyth Union workhouse was opened in 1840 on the south side of the Penglais Road to the east of the town. The workhouse had a frontage of 220 feet and could accommodate 200 inmates. The building was designed by WR Coulthart. The site layout is shown on the 1905 map below. The two-story main building faced to the west and had an E-shaped layout. The master's quarters were at the centre with males accommodated to one side and females to the other. The centre rear wing contained kitchens and dining hall. Tramps and vagrants were accommodated overight in a spacial block which included stone-breaking cells. Inside each cell, large lumps of stone were broken with a hammer untill the pieces were small enough to be pushed thorough a metal grill to the outer yard. In 1894, the British Medical Journal set up a "commission" to investigate conditions in provincial workhouses and their infirmaries. Following a visit to Aberystwyth, the commission's report described the workhouse as "a cheerful-looking place, clean and well cared for." The sick, too, received genereally good care. The commission's recommendations included: an enlargement of the infirmary, to give more space in the wards, especially for the women, and to provide wards for isolation; the provision of separate quarters for the imbeciles and idiots, a new lying-in ward, and bathrooms attached to the wards. As regards staffing, the report suggested the employment of a paid attendant in the sick wards during the night, and of trained nurses for dealing with fever cases. Further details are available in the full report. The site is now occupied by the Bronglais Hospital. A hospital car-park now occupies the area where the workhouse stood and all the original buildings have been demolished. 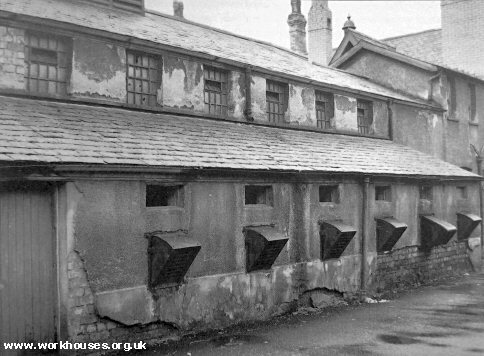 However, several older buildings of unknown date, including of a small block used by the hospital's estates department, stand (2000) roughly where some of the workhouse perimeter blocks were located. Aberystwyth site from the north, 2000. 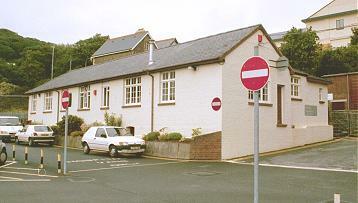 Aberystwyth estates office from the south-west, 2000. Ceredigion Archives, Old Town Hall, Queen's Square, Aberystwyth, Ceredigion SY23 2EB. Surviving records include: Guardians' minute books (1869-1930); Financial records (1881-1930); Vaccination records (1853-1918); Births (1883-1930); Deaths (1883-1914); etc. Transcriptions of various Aberystwyth Union records, e.g birth records, dietary, recipes etc.